Season Series: 0-0, First time playing. Notes: Minnesota is having a really rough year. The pitching is giving up 5.4 runs per game, highest in the majors outside of Colorado. They can still put some runs up on the board, however. Trevor Plouffe is astonishingly the hottest hitter in the majors this month and is up to 14 homers on the year. Joe Mauer still hits like Joe Mauer when he’s in the lineup and not making shampoo commericals. Justin Morneau looked like he had recovered from his concussion in May but has slumped in June. Simply put, these are game the Bucs should win. Diamond’s been the only bright spot on a horrible Twins staff this year. Correia hasn’t won at PNC since last June 22. In four starts since moving back into the roatation, Liriano’s been okay: almost 6 IP per start and has lowered his ERA by over two runs. He still walks too many on most days, but if he’s on he could carve up this Pirates team. Bedard looks to bounce back from a rough outing. The young Aussie will get plenty of chances to see if he can stick around with Minnesota out of the race already. JMac continues to build his resume for an All-Star bid. Mike Fast at Baseball Prospectus has done more work than anyone else I’ve found trying to give objective analysis to catcher defense. In his latest piece he dissects the effect catchers have on ball and strike calls based on their setup and movement. Standing out among his conclusions: Over the last five years, Doumit is the worst at framing pitches to create strike calls for his pitchers, costing the team 26 runs per 120 games played. The article is well worth a read even if you don’t want to get into the deep number crunching parts. There are animated .gifs illustrating different techniques by various catchers that help or hurt their pitchers, including one that shows Doumit nodding his head as he follows pitches that are low in the zone, which leads to more ball calls. Big Night: Pirates win game, win draft. Great win last night for the Bucs. Ryan Doumit was 4-4 including a three run bomb. Jose Veras came into a tough spot and froze Albert Pujols looking with the game on the line. James McDonald got the win (number 8 on the year) but I won’t be able to update the Searage Shaves Standings for a few days. Hopefully there will be a few others to add by then too. The excitement didn’t end there as the Pirates signed the #1 pick in the draft Gerrit Cole but also signed their #2 pick Josh Bell. Cole’s signing was expected but Bell was a first round talent who fell because it was believed he would follow through on his commitment to the University of Texas. Superb job by Neal Huntington to get both guys in the fold. For the first time since I started doing these, the Pirates made an actual trade. Nothing earth-shattering here. With Doumit, Snyder and Jaramillo on the DL the team was desperate for a serviceable catcher. Here’ hoping McKenry can fill that spot. Even if he can’t they didn’t give up anything of value (yet). Listening to the Pirates game last night I head the announcer say that this was Jason Bay‘s first appearance versus his old teammates. Certainly it was his first time facing the Pirates since the July 31, 2008 trade, but how many current Pirates were on that team that he left behind? Just three*: Paul Maholm, Evan Meek and Ryan Doumit. *Jeff Karstens was acquired five days earlier but didn’t make his Pirates debut until August 1. Karstens won’t pitch in this series. Correia has been a good starting pitcher since signing with San Diego two seasons ago. His ERA took a huge jump last year but his K/9 and BB/9 rates stay pretty consistent to the year before. I see him as Zach Duke’s replacement. A lottery ticket. Olsen’s had his run ins with teammates and the law. He’s also had trouble staying healthy. It would surprise me if he pitched enough to make a difference. Lefty masher. Diaz should be a good platoon partner this year for either Garrett Jones, John Bowker or (should he still be on the team) Ryan Doumit. 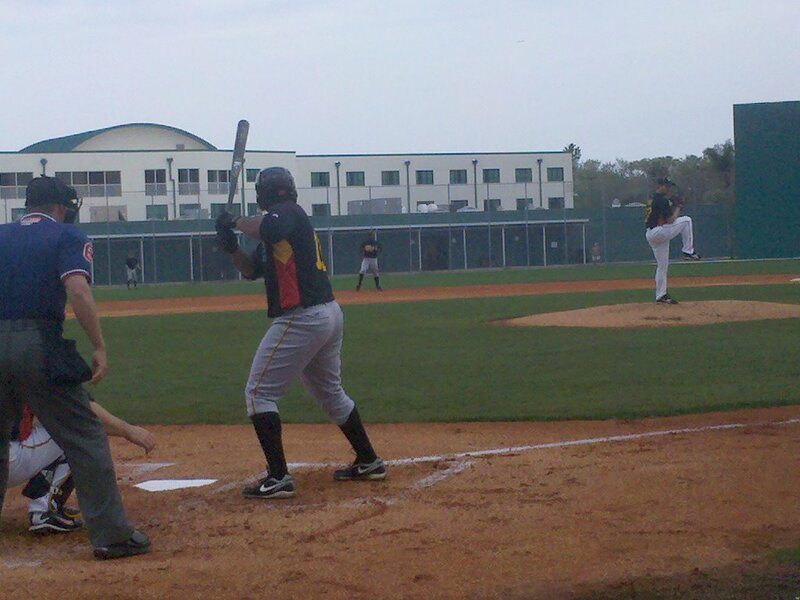 The day has finally arrived – Pedro Alvarez has been called up to the Pirates. He’ll start at third base as I detailed in my previous post. I expect him to hit 5th between Jones and Doumit, but it wouldn’t surprise me for Russell to put him lower in the lineup as JR like to “ease guys in.” (Note to JR: Not everyone needs to be eased in. Some guys will do better it you just throw them in the deep end and see if they can swim.) No word yet on who’ll be sent out to make room on the roster but the candidates include every player on the bench. OTHER BITS: Lastings Milledge is getting squeezed for playing time since Jose Tabata was recalled last week. Not that I mind this, but its Ryan Church that he’s getting squeezed for and neither of them have been hitting lately. I can’t wait for Steve Pearce to get healthy and start playing first again so Garrett Jones can slide back to RF. 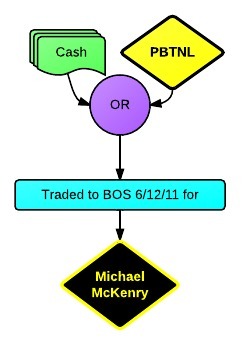 Tim at BUCCO FANS has a great redux on last year’s trade with Seattle. Well worth the read. I mentioned last week on Twitter that it is amazing how Ronny Cedeno is the best player to come out of this deal. If any of the three pitchers the Pirates received reaches the majors then it will be an even better trade. But we can worry about all of that another day. Happy #Pedropalooza everyone! UPDATE: To make room on the roster for Pedro, Akinori Iwamura was Designated for Assignment. The club has said they hope to trade him in the next 10 days. Good luck with that. Pedro is batting 6th and playing 3rd base.